Students who access and use libraries and their contents – both librarians and books – outperform those students who rarely or never use libraries. I am inspired from this quote from the article: It’s About Access. This is particularly because it outlines 2 very powerful words: Access and Use. Access and use of effective and appropriate resources. Access to effective resources paired with purposeful usage, and sound Pedagogy, are instrumental in promoting and building literacy skills, but also a passion for life, and the future, for all of our students. We greatly appreciate all of our Educators and Teacher-Librarians, who are leaders in our schools and communities, who are actively engaged in developing our physical and virtual collections on an ongoing basis, and for those who truly take the time to learn and understand the curriculum. It is through this knowledge and understanding that we can truly harness the power of our students thinking and learning potential, and use our resources to help them access what is important, and increase literacy skills, and a passion for learning. This is where Educators can be Literacy Leaders and Experts within our schools, and can provide the structure for students to purposefully use the resources that are available. 1. Actively develop your classroom and Library collections on an ongoing basis, both physically and virtually. 2. Ensure your collections are appropriate and Culturally Relevant for your students. 3. Provide flexible and ongoing access to resources. Break down the barriers of access. 4. Promote the resources! Use twitter, other forms of Social Media and technology. 5. Engage students in the process of Inquiry. Help students understand the power of their own thinking, honour that thinking. 6. Be confident enough in your knowledge and understanding of the Curriculum. 7. Be flexible with your planning, that you can follow new lines of thinking and creativity. Structure your instruction flexibly for the students. 8. Providing clear frameworks for students to use the resources appropriately and hone in new skills. 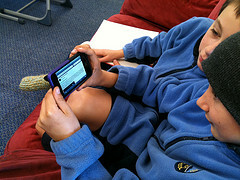 We can help our students make effective use of the materials in our collections, both physically and electronically. This will help students to enhance their critical thinking skills, including reflection and metacognition skills. I believe that these are important skills of any century, but especially in our 21st Century. The age of exploding information, where millions of resources and information exist everywhere in many different places and spaces. We can all strive to help students become masters in their areas of interest, and of their futures.